For the very determined, if someone says you can’t do something or something will never happen, they will go out of their way to make every effort to make sure it does. That applies very much to this week’s song. That’s Not My Name by the Ting Ting’s is a terrific catchy pop song, but as Katie White, the group’s singer and guitarist said, “Everybody told us That’s Not My Name would not get played on the radio because it wasn’t pop enough or indie enough, but sometimes it takes touring our butts off to get the songs heard.” It worked. 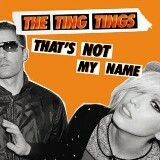 The Tings Tings are a duo from Salford, Greater Manchester with the other member being drummer Jules De Martino. De Martino was born in 1969 and White was born in 1983. The former was originally from London and formed his first band, Mojo Pin in the early nineties. Katie was born in Lowton in Cheshire and made her debut as a member of an all-girl punk called Technical Knock Out often shortened to TKO. The pair met in Manchester and discovered they both had a mutual respect for the Bristol band Portishead and so the two of them, along with De Martino’s friend Simon Templeman formed a band called Dear Eskimo. They signed a deal with Mercury records, but changes within the label curtailed the band’s activity and they disbanded. They were not happy as Katie recalled in an interview with Q magazine, “You feel like your career is over at 22 and you haven’t even got a record out. It was like, you really are that forgettable unless you put your stamp on something.” The pair briefly took other jobs, but decided to try again and reform, this time as a duo and called themselves the Ting Tings which was the name of a colleague of White’s when she worked in a shop.